developments in machines, cleaning methods and products. Some companies take your rugs away so that the customer cannot see their method of cleaning, which can be very fast and ineffective. In your home they may clean your delicate rugs using under-powered machines, a normal carpet cleaning wand instead of a close contact hand tool, and may not bother to rinse out the rug with a mild, very low pH solution. We always carry out a dye-bleed test on rugs to eliminate any potential colour run. But to be extra safe we always rinse out furniture and rugs/oriental carpets with a low pH rinsing solution. We have two methods of cleaning expensive, delicate rugs. By using either a dry solvent machine or a water extraction machine, using a close contact tool for a deeper clean and much faster drying. 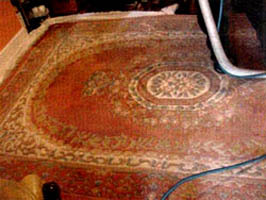 For pure silk rugs we vacuum, then odourless dry-solvent extraction clean. 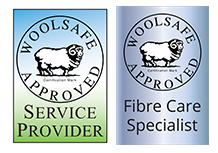 Deep pile wool rugs are power vacuumed several times, then pre-treated with a soil and stain remover which is brushed in and rinsed out thoroughly using our very powerful extraction machine.